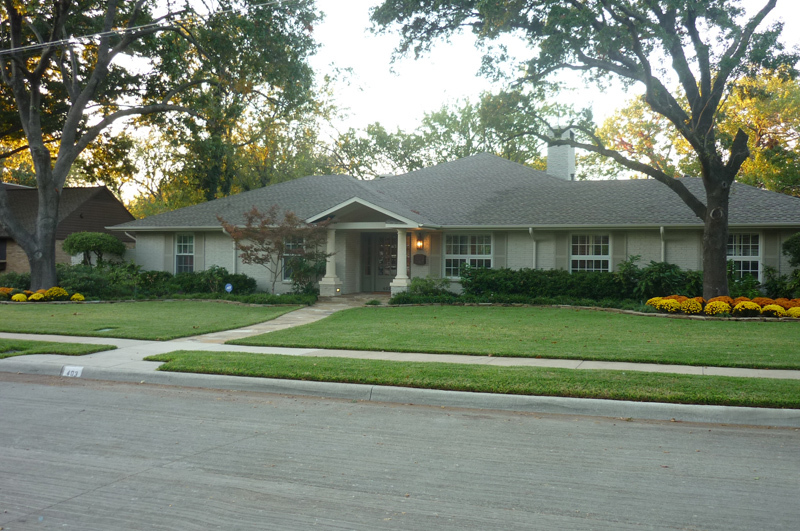 November 2014 Yard of the Month! Yard of the month – truly an honor. 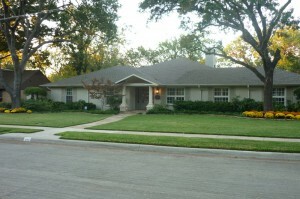 Drought and watering restrictions, total reconstruction of the house, and nursing an ailing red oak tree have hindered our focus on getting the front yard in shape. That focus became clear when we were getting prepared to celebrate my mom’s 90th birthday at our house. My husband wanted it to look nice for the party and chose the orange and yellow chrysanthemums combination to give the yard a pop. He enjoys caring for the landscape himself and has done all the work, including the dry stacked stone surrounding the front beds. We have lived in our home for over 23 years, but we have been members of the community for most of our lives. Hutch’s parents live a block away and he grew up playing in the creek on the back side of our house. Our two boys continued the tradition along with many nephews and nieces and friends over the years. Our love for this neighborhood and city of Richardson keeps us ever striving for improvement and beautification of our surroundings. Our neighbor down the street, who won yard of the month a few years ago, said “Once you have won, the pressure is on for the whole month to keep the yard perfect!” I think we are up for the challenge. Thank you, Heights Park Neighborhood Association and committee for this honor.